JMH: Who or what is Energyman? MARK: Good question and one that deserves a 2-part answer! 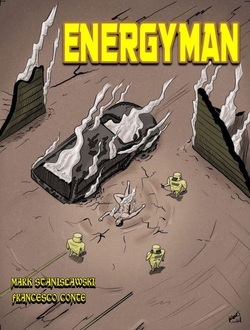 1) Energyman is an ongoing, Creator-Owned super-hero book from RocketBlast Comics. I write and letter the book and all of us here at RocketBlast are working hard to get this book out on a bi-monthly basis. 2) As for what is Energyman, he's Rob Galway, the sole survivor of a mysterious non-nuclear explosion that wiped out Alamogordo, New Mexico and everything else in a twenty mile radius. What complicates matters is that, due to the accident, Rob has partial amnesia so he really doesn't remember much about before the explosion. After being found near Ground Zero, Rob is transported to Area 51 and the fun begins! MARK: I wanted to set the tone early that this is NOT the world that you see when you look outside your window. It's Earth, yes, but this Earth no longer has Alamagordo, New Mexico. Marvel and DC like making their Earth's as close to reality as possible e.g. whoever the President is in reality is the President in their comics. My Earth is an Earth where anything can happen, especially when you start involving people with extraordinary abilities. Cities can get destroyed, the leaders of countries may not be the same leaders you see in our reality. It's a true alternate Universe. I've talked with [Publisher] Dallas Wilson about this and he seems to be on board with the concept. This, in a nutshell, will be RocketBlast's super-hero Universe. Don't discount anything because it may just happen. There are no taboo's. JMH: Does Energyman have supporting characters and if so can you tell CBI about them? MARK: Yes, there are supporting characters aplenty! Colonel Olsson - The Colonel is a watchdog, of sorts. He's been charged by the U.S. Gov't (The President) to keep an eye on Energyman, keep him calm but also to find out what makes Energyman tick, what his weaknesses are and try to come up with a means to stop Energyman, should the situation ever require it. He doesn't trust Rob, with his incredible power, but the Colonel can't just put a bullet in Rob's brain as he sleeps. He has been given orders and he must follow them. Dr. Milt Davis - Dr. Davis is Area 51's resident scientist who specializes in biology. He's trying to find out all of Rob's secrets concerning his powers but he has no idea of the Colonel's true agenda. Amanda Paisley - Amanda is a Senior Tech at Area 51 and will become a love interest for Rob. That's really all I'm going to say about her. Judy Green - A news reporter who vows to get to the bottom of the Alamogordo explosion! We also have a handful of bad guys that give our hero one headache or another! JMH: Was Energyman inspired by anything from your past or real life experiences? MARK: I love science. I'm a science geek and I came up with the concept of Energyman during high school science class! We were learning about different types of energy and I was heavily into comics at that time so the idea just hit me! I came up with a basic storyline during the class, so I didn't really pay attention to the teacher for the rest of the class. I've made some story changes since that time but the character has remained the same. You look at Firestorm, Captain Atom, Solar, what do they all have in common? They're all nuclear-based! Dangerous! Energyman is non-nuclear and thereby environmentally friendly! A hero for the 21st Century! MARK: If Energyman carries any message it's that A) the human world is an incredibly complicated place and B) that every action has an equal and opposite reaction. There are consequences for your actions, no matter how noble your intention. We'll get to see how things snowball as each issue goes by. MARK: The incredible art on our premiere issue is by Italy's Francesco Conte with a cover by Keelan Malo-Smith. Keelan will take over interiors with #2. 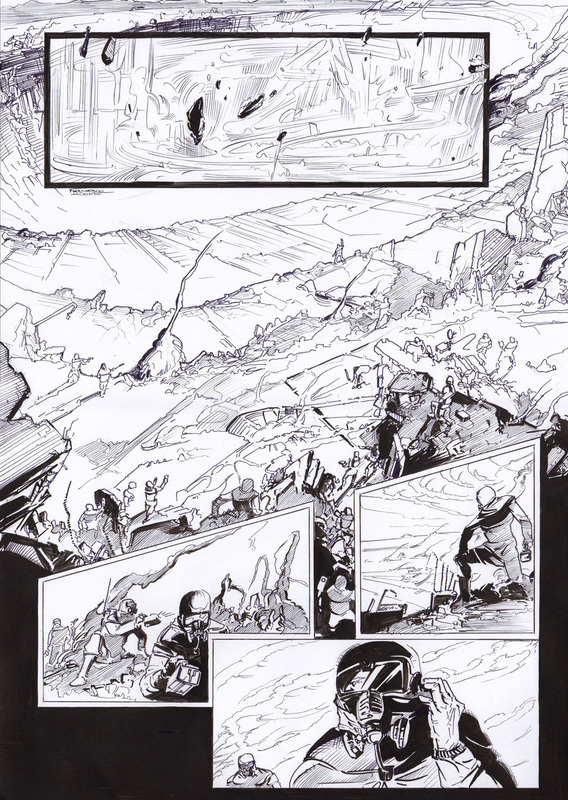 Keelan's stuff, while raw, looks pretty good and Keelan has a much more straightforward panel layout than Francesco. Both Artists bring their own unique touch to the table. I'm very happy that Energyman has been associated with both these talents! JMH: Will Energyman be released in digital format, web comic, or print? JMH: Where can fans get a hold of Energyman? MARK: Digital issues can be purchased through Comixology, Amazon Kindle store, Itunes, Google Play and, of course, through rocketblastcomics.com starting June 1. I know Dallas is working very hard with retailers (both brick-and-mortar and internet services) to get everyone on a mailing list for the RocketBlast catalog. We'll also be showing up at Conventions so be on the lookout for RocketBlast! JMH: Finally, is there anything coming up in further Energyman stories, or other projects you want people to know about? MARK: I've always touted Energyman as a very ambitious project because, even though there are separate stories throughout, the entire first "arc" of Energyman is actually 12 issues. As each issue goes by you'll get one more piece to the puzzle. Things won't always be as they appear to be. 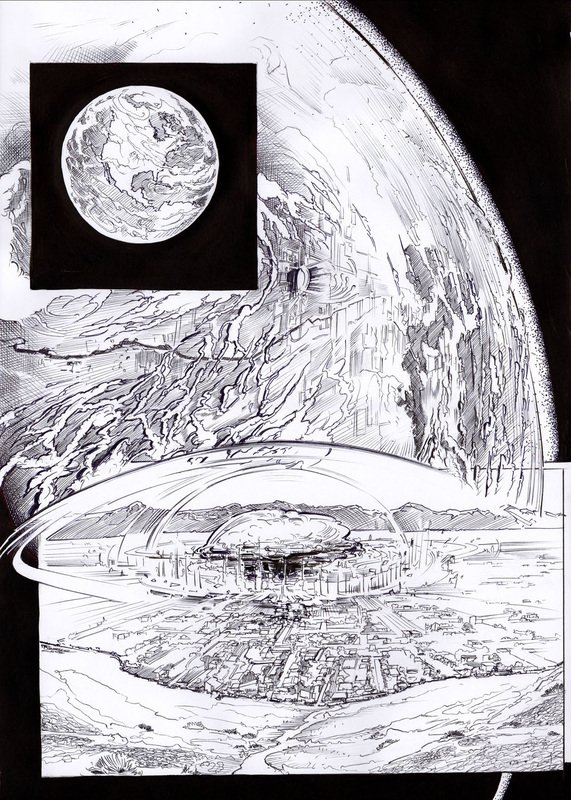 By the end of issue 12, the many questions are answered and things are set up for the next arc. I don't know how else to say it without giving too much away. Dallas and I have also come up with an idea that parallels the Energyman book and Colonel Olsson will figure heavily in that book. Since digital has now become a viable option, I've also toyed with the idea of re-lettering my self-published, The Elvis Files and putting that out there as a digital offering. Of course, I have plenty of original print graphic novels that are available and can be purchased by contacting me at mstanislawski465@gmail.com. MARK: I think we've all been in that dark place where you doubt yourself or you feel that you're never going to accomplish anything and you kind of give up. Any Writer will tell aspiring Writers that they need to write. As much as possible, preferably every day. You need to make that conscious decision that, come Hell or high water, you'll write 'X' amount per day. Whether you're writing comic scripts, blogs or prose for a novel. Know your grammar, punctuation, spelling...the more you write the more this stuff will become second nature. It all begins, though, with that decision and then following up with action. JMH: Mark, CBI appreciates your time. ALL the best!! MARK: Thank you, John! I hope that fans of super-hero comics give Energyman a try and stick with it. I think they'll be pleasantly surprised!